Today I had a look at the Sum USB keyboard adapter for my Amiga 4000T! The Sum USB keyboard adapter is designed with Classic Amiga 2000, 3000, 4000 and CD32 systems in mind, and includes cable converter for the A4000D connection, A2000, A3000 and A4000T Din plug as well! You can buy the adapter for 35.50 Euro from amigastore.eu here. More information (including the manual and support files) are on Sum adapter maker Retro 7-bit's website here. They also made the Rys mk II USB mouse adapter I looked at previously in this blog entry. I added the DIN plug converter cable to the Sum adapter since I am connecting it to the Amiga 4000T. Here it is below with the old Amiga 4000T keyboard and the newer usb one! There is a green light on the converter that lights once it is running. As with the Rys, the Sum adapter's firmware can be upgraded from a Windows PC, and there are some options to configure the Sum to expect a Mac or PC keyboard, amongst other options. Full details are available on Retro 7-bit's support site here. No drivers are needed to use the Sum USB keyboard adapter on the Amiga. I did find that the Ducky Zero keyboard did work with the Sum adapter on the Amiga 4000T, but for some reason the Amiga keys (and Alt keys) on the keyboard did not work. 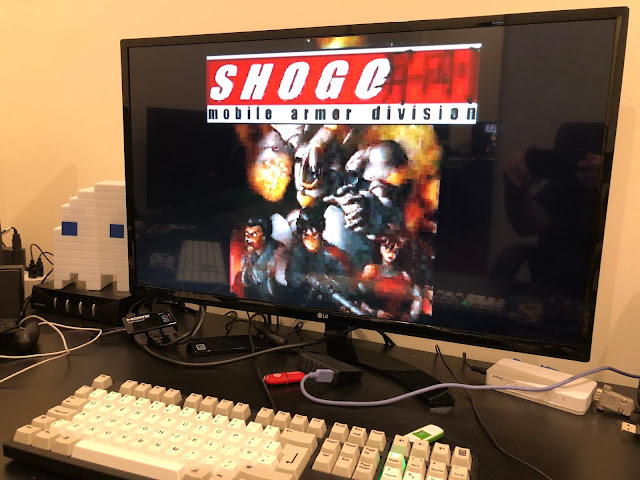 I changed keyboards to the AmigaOne USB keyboard from my X1000, and I am pleased to report this keyboard worked perfectly, with the Amiga keys working as expected. With a device like the Sum adapter, there is not much else to cover - you can change the keyboard mapping for the Amiga keys to the Alt keys or the Amiga keys (Windows keys) with n F12+Pause keyboard press when the Sum is active on the Amiga. It is good to be able to use USB keyboards and USB mice now with the Amiga 4000T!